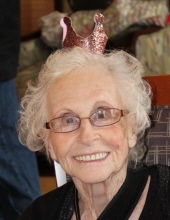 June Elizabeth Hunker, age 89, passed away Friday April 12, 2019. She was born February 13, 1930 in White Cloud, Kansas to Edna and Arthur Hooper. June was a wife, mother, nana, and a friend to all she met. She will best be remembered for her awesome baking, which she took great pride in. June attended Berkley Community Church for many years. June also was active in leading the Ladies’ Ministries at Troy Assembly of God and Faith Temple Church of God. June felt her mission was to serve people. She prepared and served alongside her husband, Jack, many meals at shelters. Her food not only tasted great, but her smile and kind words were always well received from those that she served. June taught K-8 in a one room school house in White Cloud, Kansas. She loved teaching and her students. After moving to Michigan, she worked as a teacher’s aide at Berkley Elementary for several years. June also worked for Bonanza and Marriott doing what she enjoyed, cooking. June loved her family and her friends and treasured spending time with them. Cooking meals and having everyone gather around the table was special, especially if it ended playing Farkel or Phase 10. She is survived by her husband, Donald “Jack” Hunker, whom she married May 16, 1952 in White Cloud, Kansas. Also surviving her are children, Donald (Barbara) of Minneapolis, Minnesota, Roger (Janet Lafluer) of Rochester Hills, and Angela (Brian) Haley of Berkley. She adored her six grandchildren, Marie (Nathan)Wall, Adriane (Matthew) Custer, Erin (Robert) Hillegas, Lindsey (Denis) O’Donovan, Lauren Hunker and Luke Hunker; as well as her eight great grandchildren who loved their ol’ nannie. Preceding her in death are her brothers, Delaine Hooper and Clyde Hooper of Hiawatha, KS. The family will receive friends Tuesday 3:00 PM until 8:00 PM at the Sawyer-Fuller Funeral Home, 2125 12 Mile Road, Berkley (two blocks west of Woodward Avenue). Mrs. Hunker will lie in state Wednesday from 9:30 AM until the time of service 10:00 AM at the Berkley Community Church, 2855 Wiltshire Road, Berkley. To send flowers or a remembrance gift to the family of June Elizabeth Hunker, please visit our Tribute Store. Mrs. Hunker will lie in state at church from 9:30 AM until the time of service. "Email Address" would like to share the life celebration of June Elizabeth Hunker. Click on the "link" to go to share a favorite memory or leave a condolence message for the family.